We pride ourselves as not being just another whisky shop. With an incredible range of over 2000 different whiskies and a stock holding of over 50,000 bottles, we are a paradise for the drinker, the collector or Inverstor. Prices range from £10 for the standard blends to over £30,000 for the world's most expensive whisky. The major part of the range is Single Malts, however we have a vast selection of other whiskies from every corner of the globe. We currently have 2 outlets, the head office is located in West London, half way between Central London and Heathrow airport. 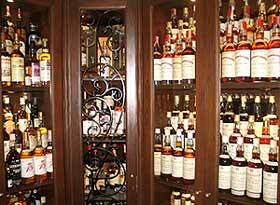 We have a large 1000 square foot showroom for you to look around, with many whiskies available to taste will you spend. We will be happy to collect and return you from the station "Boston Manor" (Piccadilly Line). Our new shop in the heart of the City of London, is situated by "London Bridge". We are just behind the famous "Borough Market" and inside the wine and spirits educational centre, VINOPOLIS. 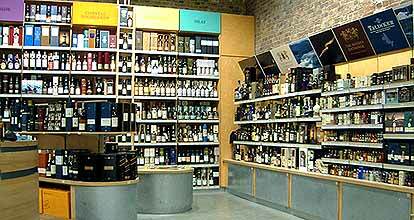 Why not go through the tour and learn about the wine regions, gin, absinthe and of course whisky. (You do not have to go on the tour to visit our shop). Just around the corner is Shakespeare's Globe theatre and Tate modern Museum.